With over 70 years of excellence, Weider is the gold standard in sports nutrition. Its Gold Whey is the superior protein powder that guarantees you faster muscle building and faster recovery. Gold Whey is ultrafiltered to ensure it contains all the anabolic properties of natural whey protein. This way, it carries a complete amino acid profile, ensuring you get all the amino acids needed for faster muscle growth. In its 23g of BCAA you get almost 11g of Leucine – the most anabolic BCAA, the one that contributes most to muscle growth! On top of its unmatched quality you get an unmatched taste! Nourish your hard-working muscles with pure protein goodness: each sip brings an incredible mouthful of richness, making you look forward to the next one. Whey protein supplementation is a must for bodybuilders and athletes. Gold Whey is the superior choice for serious bodybuilders who can only trust what decades of experience in designing and delivering the best products can bring. 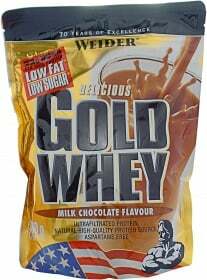 You don’t build superior quality muscle mass with bronze or silver... Go for gold with Weider Gold Whey! Have a question about Gold Whey? What is it, what does it do, how and when to use or something else? Ask us. 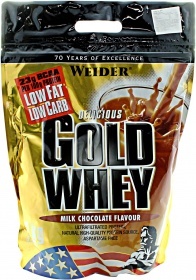 “Weider Gold Whey 908g - Opportunity” is currently out of stock. Enter your details below and we will let you know when it's back in stock. “Gold Whey 908g” is currently out of stock. Enter your details below and we will let you know when it's back in stock. Other Ingredients: Flavor Chocolate: Whey Protein Concentrate, 5g cocoa powder low fat (Theobroma cacao L.) flavor (chocolate flavor), sweeteners: acesulfame K, sodium cyclamate, sodium saccharin; emulsifier: soy lecithin; coloring: caramel (E150a). Mix 30 g of product with 300 ml of skimmed milk or water. Preferably after training.